eCommerce is booming. In 2017, global online retail sales reached a high of $2.3 trillion, a staggering 25% increase on the previous year (via eMarketer). 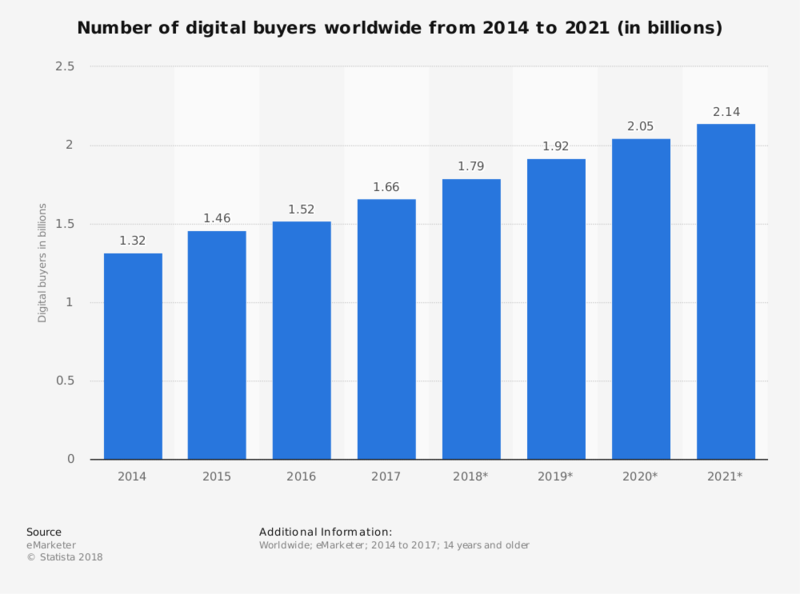 B2B eCommerce now makes up an even more sizeable share of the entire eCommerce global market, estimated at $7.7 trillion in 2017. It doesn’t matter whether you are a small business or enterprise, in products or services, physical or digital, in B2C or B2B. If you haven’t set up your eCommerce solution, or optimized your existing one, then you’re missing out on a slice of the action. Let’s dive on into some of the best benefits of eCommerce. Who shops online? 4 out of 5 people in the US, for a start! Online shopping is omnipresent. According to the latest figures from Statista, 80% of Americans online will make at least one eCommerce purchase in 2019. Everyone is doing the online shop. From groceries to clothes, to buying music, Christmas presents… is there anything that you can’t purchase online? Not only is online shopping via desktop now standard across the globe, mobile eCommerce is growing steadily, with 37% of global shoppers now having paid for products online via their mobile device according to the latest research from PwC. Put simply, if you don’t have eCommerce as part of your business strategy now, then it’s past time to get involved. And for those that already have eCommerce as part of their revenue streams, what are you doing to boost it? Consumer attitudes, motivations, and habits have changed since we’ve come around to a digital-first way of life. It’s now a digital-or-perish world out there unless you’re cultivating a hip, word-of-mouth, hidden speakeasy. The latest research from Salesforce confirms this rising trend. 56% of customers will actively try to purchase from the most innovative companies. 57% of customers will go elsewhere because a competitor provides a better experience. And in the B2B world, 69% of people expect Amazon-like purchasing experiences. Your business cannot afford to go without an optimized eCommerce solution. The customers you want to attract will go elsewhere. One of the biggest benefits of eCommerce is that you can now reach (and sell to) a global audience instead of just zeroing in on local. 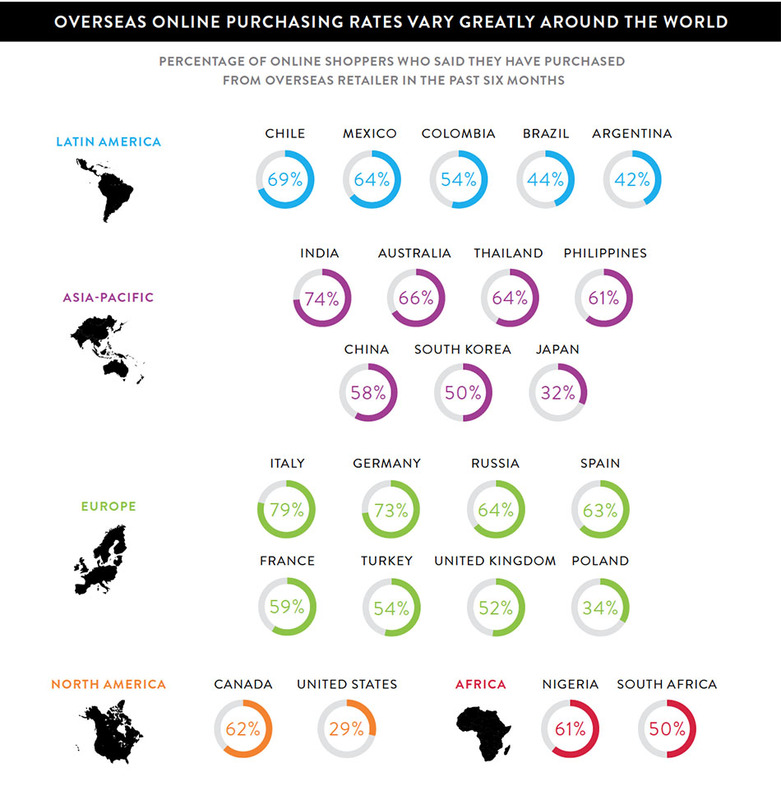 As per Neilsen’s 2016 Global Connected Commerce report, 57% of shoppers made a purchase from overseas in the past six months. According to Payvision’s 2017 report, cross-border eCommerce is growing at a higher rate than domestic eCommerce, at an expected 17% vs 12%. By reaching a global audience, you can find more markets for your products or services that you may not have even considered. While there might not be a huge market in your area, Jo from Singapore might be extremely excited to purchase your new ergonomic keyboard for fitting out her team’s new modern office. Is concern about the financial transactions side of things holding you back from taking the dip into eCommerce? It shouldn’t be. There are now plenty of solutions in place that protect both the business and the consumer from fraud, botched transactions, and other security issues. On the customer information side of things, you can encrypt customer data (such as name and address) both across the wire and during storage, to ensure privacy and conformance to data privacy laws (such as GDPR). While eCommerce in itself can be a great way to generate further revenues, building and optimizing this website functionality to glean customer insights can really make a difference. By examining customer behaviour metrics you will be able to tailor your marketing and sales techniques to what customers want. These metrics can help determine where you’re losing customers in the sales pipeline, which products they’re most interested in (so you can concentrate on expanding these lines), discovering the effect of sales marketing, and plenty more. Fortunately, there are plenty of tools to help along the way. Take a look at Google Analytics, to help monitor web traffic, do funnel analysis, and more, plugins for Shopify, like Analytics Buddy, and services like Facebook Pixel for retargeting previous shop visitors. These are just a few of the thousands of helper software applications and add-ons you have at your fingertips, or you have the option to build custom data collection and analysis tools yourself with the help of experts. To be successful in 2018, it’s imperative that eCommerce is part of your business strategy. Optimize your eCommerce to leverage all the data it can provide to help boost sales, guide product development, and hone your target markets. To make the first step, it’s time to start talking with an expert eCommerce solutions development company – like us, here at 247 Labs. We have helped build secure, professional eCommerce platforms with exceptional UX/UI for companies across the US, Canada and Europe. Head across to our eCommerce solutions page to see what we can do for you or get in touch at +1-877-247-7421.